Niko Kranjcar was the star with two goals as Tottenham comfortably moved into the fourth round of the FA Cup at the expense of struggling Peterborough. The hosts took the lead when Jermain Defoe's flick allowed Kranjcar to fire past England Under-21 keeper Joe Lewis. The Croatian midfielder then latched on to Gareth Bale's pull-back after the break and doubled the advantage. Bale crossed again for Defoe to make it three before Robbie Keane sealed the win from the spot late on. The result means Spurs have still never lost to Posh, who will now focus on correcting the poor league form that has seen them slip to the bottom of the Championship. Spurs boss Harry Redknapp had fielded a strong side at White Hart Lane, quashing any rumours of key players being saved for the club's quest for a Champions League spot. And a team of 11 full internationals quickly set about dominating the game, with Peterborough's lone striker Craig Mackail-Smith looking very isolated in the opening stages. Defoe somehow managed to hit the bar from only five yards out, while Tom Huddlestone saw a long-range shot saved by Lewis. A wonderful move from the hosts then ended with a back-flick from Defoe setting Kranjcar free in the area - only for Lewis to pull off an outstanding save. But the Croatian was not to be denied for long, breaking free from midfield after being set up by Luka Modric and letting fly with a low shot past Lewis' despairing dive. Peterborough never looked likely to fight back into the game and their faint hopes were all but ended when Kranjcar bagged his second after the break. Keane inspired another fine move that culminated with Bale pulling the ball back from the byline and into the path of the midfielder who fired past Lewis. Mackail-Smith did see a powerful shot brilliantly saved by Heurelho Gomes but Tottenham responded by rushing upfield to make it 3-0 when another cross from Bale was turned in by Defoe - his 16th goal of the season. Substitute Danny Rose impressed for the hosts after coming on in the second half and when he was fouled inside the box late on, Keane wrapped things up from the penalty spot. Spurs will now hope for a kinder fourth-round draw than the clash with Manchester United they endured last season. "I put a good team out to win the game. "You don't want to take liberties and winning is a good habit. I didn't want to put a weak team out and turn in a sloppy performance and then regret it afterwards." "We've got a chance the same as all the big boys. We have a good squad and there was no reason for me to mess about too much today. "It would be nice to see someone outside the big four win the cup again. There's a long way to go but I like the way we are playing. We moved the ball well and played the ball around the pitch quickly." "The second-half, we were too soft and conceded some soft goals. "At times they were chasing shadows, but they enjoyed the day. "They have some of the best players in Europe, and possibly the world." 90:00+5:05 The final whistle goes and the game is over. 90:00+4:05 Assist by Danny Rose. 90:00+4:05 GOAL - Robbie Keane:Tottenham 4 - 0 Peterborough Robbie Keane scores a placed penalty. Tottenham 4-0 Peterborough. 90:00+3:10 Penalty awarded for a foul by Chris Whelpdale on Danny Rose. 90:00+0:59 Robbie Keane is caught offside. Joe Lewis restarts play with the free kick. 89:10 The ball is delivered by Danny Rose, clearance made by Craig Morgan. 88:27 Inswinging corner taken by Tom Huddlestone from the left by-line played to the near post, Craig Morgan makes a clearance. 86:02 Shot on goal comes in from Dominic Green from the free kick. 86:02 Substitution Charlie Lee leaves the field to be replaced by Dominic Green. 86:02 Booking Danny Rose receives a caution for unsporting behaviour. 85:50 Foul by Danny Rose on Charlie Lee, free kick awarded. 83:40 Unfair challenge on Sebastien Bassong by George Boyd results in a free kick. Sebastien Bassong takes the direct free kick. 81:17 A cross is delivered by Charlie Lee, clearance by Michael Dawson. 80:36 Corner taken by Luka Modric from the right by-line to the near post, George Boyd manages to make a clearance. 80:00 A cross is delivered by Danny Rose, clearance by Craig Morgan. 78:20 Substitution Kyle Naughton replaces Gareth Bale. 77:52 The official flags Robbie Keane offside. Joe Lewis takes the indirect free kick. 73:27 Roman Pavlyuchenko produces a right-footed shot from deep inside the penalty box which goes wide of the right-hand upright. 73:27 Substitution Jermain Defoe leaves the field to be replaced by Roman Pavlyuchenko. 72:02 Substitution Danny Rose joins the action as a substitute, replacing Niko Kranjcar. 72:02 Shot from just outside the box by Tom Huddlestone goes over the target. 71:33 Short corner taken by Niko Kranjcar from the left by-line. 69:28 Gareth Bale provided the assist for the goal. 69:28 GOAL - Jermain Defoe:Tottenham 3 - 0 Peterborough Jermain Defoe gets on the score sheet with a goal from close in low into the middle of the goal. Tottenham 3-0 Peterborough. 67:08 Heurelho Gomes takes the direct free kick. 67:08 Substitution Shaun Batt on for Lee Frecklington. 67:08 Tom Williams concedes a free kick for a foul on Gareth Bale. 66:21 A cross is delivered by Paul Coutts, Sebastien Bassong manages to make a clearance. 65:33 Shot by Craig Mackail-Smith. Save made by Heurelho Gomes. Corner from the right by-line taken by George Boyd, Sebastien Bassong manages to make a clearance. 60:56 Outswinging corner taken by Niko Kranjcar, clearance made by Ryan Bennett. 57:46 Corner taken by George Boyd from the right by-line, Lee Frecklington produces a header from inside the six-yard box that clears the bar. 56:52 Gareth Bale provided the assist for the goal. 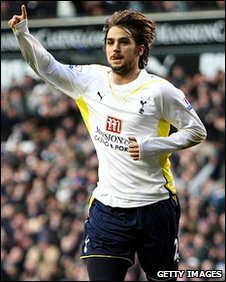 56:52 GOAL - Niko Kranjcar:Tottenham 2 - 0 Peterborough A goal is scored by Niko Kranjcar from close in to the bottom right corner of the goal. Tottenham 2-0 Peterborough. 55:55 Lee Frecklington concedes a free kick for a foul on Tom Huddlestone. Free kick taken by Michael Dawson. 54:44 Corner taken by Niko Kranjcar from the right by-line. 54:00 Shot by Tom Huddlestone from deep inside the six-yard box clear the bar. 53:04 Unfair challenge on George Boyd by Niko Kranjcar results in a free kick. The free kick is delivered right-footed by Chris Whelpdale from right channel, Tom Huddlestone manages to make a clearance. 51:13 Lee Frecklington challenges Tom Huddlestone unfairly and gives away a free kick. Direct free kick taken by Sebastien Bassong. 49:59 Luka Modric fouled by Scott Griffiths, the ref awards a free kick. Niko Kranjcar restarts play with the free kick. Effort on goal by Robbie Keane from just inside the area clears the crossbar. 48:44 Effort on goal by George Boyd from 35 yards missed to the left of the goal. 47:57 Effort on goal by Tom Huddlestone from outside the box goes harmlessly over the bar. 47:48 Gareth Bale delivers the ball, clearance made by Craig Morgan. 47:27 Robbie Keane takes a shot. Joe Lewis makes a save. 45:00+2:02 The referee blows for half time. 45:00+0:11 Free kick taken by Tom Huddlestone. 45:00+0:11 Booking Charlie Lee receives a yellow card. 44:59 Foul by Charlie Lee on Robbie Keane, free kick awarded. 44:43 Lee Frecklington takes a shot. Save by Heurelho Gomes. 44:08 The offside flag is raised against Jermain Defoe. Indirect free kick taken by Joe Lewis. 42:04 Inswinging corner taken left-footed by George Boyd, Michael Dawson manages to make a clearance. Lee Frecklington takes a shot. Blocked by Michael Dawson. 41:50 The ball is delivered by Robbie Keane, Craig Morgan manages to make a clearance. 41:13 Niko Kranjcar takes the free kick. 41:13 Booking Booking for George Boyd. 41:04 George Boyd challenges Gareth Bale unfairly and gives away a free kick. 40:54 The ball is crossed by Niko Kranjcar, clearance made by Ryan Bennett. 38:48 Effort on goal by Tom Huddlestone from 20 yards. Save by Joe Lewis. Outswinging corner taken from the right by-line by Tom Huddlestone. 37:54 Drilled left-footed shot by Gareth Bale. Save by Joe Lewis. Outswinging corner taken by Niko Kranjcar from the right by-line, clearance by Craig Morgan. Niko Kranjcar decides to take the corner short. 37:22 Wilson Palacios has an effort at goal. Save by Joe Lewis. Niko Kranjcar decides to take the corner short. 36:20 Alan Hutton sends in a cross, clearance by Craig Morgan. 34:15 Assist on the goal came from Luka Modric. 34:15 GOAL - Niko Kranjcar:Tottenham 1 - 0 Peterborough Niko Kranjcar fires in a goal from just outside the penalty box to the bottom right corner of the goal. Tottenham 1-0 Peterborough. 31:41 Effort on goal by Niko Kranjcar from outside the box goes harmlessly over the bar. 30:46 Unfair challenge on Alan Hutton by Paul Coutts results in a free kick. Direct free kick taken by Michael Dawson. 30:08 Paul Coutts gives away a free kick for an unfair challenge on Michael Dawson. Direct free kick taken by Alan Hutton. 28:28 Robbie Keane takes a shot. Save by Joe Lewis. 28:01 Free kick awarded for an unfair challenge on Niko Kranjcar by Charlie Lee. Niko Kranjcar restarts play with the free kick. 26:34 Niko Kranjcar takes a shot. Save made by Joe Lewis. Corner taken by Niko Kranjcar, clearance by Ryan Bennett. 24:59 Free kick awarded for a foul by Alan Hutton on Scott Griffiths. Direct free kick taken by Joe Lewis. 24:24 Robbie Keane takes a shot. Craig Morgan gets a block in. Corner taken right-footed by Niko Kranjcar, Joe Lewis makes a save. 23:56 Free kick awarded for an unfair challenge on Alan Hutton by Scott Griffiths. Alan Hutton takes the free kick. 23:22 The ball is crossed by Paul Coutts, Headed effort on goal by Chris Whelpdale from inside the penalty box misses to the right of the goal. 22:53 Centre by Craig Mackail-Smith, clearance by Sebastien Bassong. Short corner worked by Paul Coutts. 22:04 Robbie Keane has an effort at goal from just outside the box which goes wide of the right-hand upright. 21:56 Centre by Gareth Bale, clearance made by Ryan Bennett. 20:12 Shot by Niko Kranjcar from deep inside the penalty area misses to the right of the goal. 19:06 The ball is crossed by Alan Hutton, clearance made by Ryan Bennett. 18:39 Robbie Keane produces a cross, clearance made by Ryan Bennett. 16:34 The referee blows for offside. Joe Lewis takes the free kick. 15:51 The referee blows for offside against Robbie Keane. Joe Lewis restarts play with the free kick. 13:16 Corner taken by Niko Kranjcar played to the near post, clearance by Scott Griffiths. 13:08 The ball is swung over by Alan Hutton, clearance made by Ryan Bennett. 11:51 Foul by Michael Dawson on George Boyd, free kick awarded. Joe Lewis takes the free kick. 10:58 Foul by Charlie Lee on Niko Kranjcar, free kick awarded. Tom Huddlestone produces a strike on goal direct from the free kick, Joe Lewis makes a save. 10:36 Robbie Keane takes a shot. Save by Joe Lewis. 9:23 Jermain Defoe takes a shot. 7:30 Gareth Bale delivers the ball, Scott Griffiths manages to make a clearance. Niko Kranjcar takes the outswinging corner, Scott Griffiths manages to make a clearance. 6:57 Jermain Defoe takes a shot. Craig Morgan gets a block in. 3:07 Shot from long distance by Wilson Palacios misses to the right of the goal. 1:52 George Boyd has an effort at goal from a long way out that goes wide left. 0:42 Scott Griffiths concedes a free kick for a foul on Robbie Keane. Alan Hutton restarts play with the free kick.